Fitch Taylor : Tahiti and Peru, 1842. Attended By Her Consort The Sloop Of War John Adams, And Commanded By Commodore George C.Read. 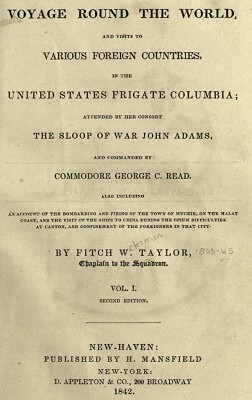 Taylor's account of the 1838-40 circumnavigation of the Columbia and John Adams includes descriptions of ports of call in Brazil, Arabia, India, Malaya, China, Siam, Hawaii, Tahiti, Chile, and Peru. AFTER a passage of thirty-one days, we reached the harbor of Papeete, island of Tahiti, without incident of sufficient interest for record, save the crossing, for the third time, the equator. It was a fair night, November the twenty-seventh, and in longitude 141 W.
The last three days was a fine run, and the " Queen of the Pacific," as this green isle of the ocean has been called, rose to our view, when we were still leagues at sea. We approached it from the northeast, passing Point Venus ; and gaining a pilot at the report of our gun off the Bay of Papeete, stood in through the narrow and fearful pass, for a frigate, to the coral in-hemmed basin, on whose still bosom the Columbia is now peacefully lying. circular wall of protection, over which the foam breaks in its beautiful line of white, like a bead of nature's fillagree work, inlaying its narrow silver line either way, on the blue field of the deep. The name of the lamented and gifted Cook will always be associated with the islands of these seas, and most particularly with the Sandwich and the Society Islands, the first as being their discoverer, and the spot where his life was so abruptly terminated ; and the Society Islands, as the point of his visits and scientific observations. It was at Point Venus, seven miles from our anchorage, where Captain Cook fixed his tent on shore for the purpose of making his observations on the transit of Venus in 1769. The point derives its name from this circumstance. A beautiful ride and the residence of a missionary family at the spot, with its many associations of interest, induced me to accept the proffer of a horse from the English consul and the company of Mr. Johnson for a visit to this point. The road is an embowered way nearly its length, save where it leads directly along the beach in view of the tumbling surf, which curls its lip along every identation of the several bays, and gives forth a voice of thunder as it rolls upon the beach. the high surf where it comes in from the sea uninterrupted by the reefs, and first breaks upon the beach, is of itself a grand phenomenon that can never cease to interest the eye and the ear, for its mingled beauty and grandeur. Point Venus forms one horn of Mattavai bay, into which many vessels enter instead of Papeete bay, where our ship is anchored. The U. S. exploring squadron were anchored there but a few months since, on their first reaching the island, and Commodore Wilks (for so the young commander is styled, and with a pennant at his main is rightly so addressed) pitched his tent for observation on the same spot where Cook seventy years ago raised his. And here lay the Bounty, whose story is one of romance, and originating the poem of the "Island," from Byron's pen. The visit of the exploring squadron to this island is spoken favorably of by the missionary families. The ships, after spending a short time at Mattavai bay, anchored where our own ships are moored, as the more convenient and safe harbor. We dined with the Rev. Mr. Wilson and family. the young Tahitians, whose element is the water, diving beneath the surf as it rolled its immense swell above their heads, and broke in foam and thunder on the shore. I know not that Mrs. Stickney, in her Poetry of Nature, or Mr. Montgomery, in his descriptions of things which are poetical, has made mention of the coral forests of the sea. There is not in nature a grouping of forms and blending of colors more beautiful and gorgeous than is presented in the fantastic variety of a coral field in the deep. These islands of the Pacific are hemmed around by one line of coral reef, broken here and there so as to form inlets into the quiet basins, which constitute the harbors of the islands. We came to the shoaling water of one of the coral islets, whose submarine formation had neared the surface of the basin. It was a beautiful sight as I looked down to the submerged forests below, over which the canoe rested without rippling the surface of the still water, through which the eye gazed to the coral groves below. Page 304 DRIVE TO CHORILLOS. All Lima, or the genteeler part of it, having vacated the capital, (so we were told,) and a great proportion of the Lima society being at Chorillos, a bathing-place seven or eight miles from the city, we were willing to take a ride to this watering-place, to spend the succeeding and last day of the carnival. Most of the families who resort here for bathing take up their residences among the families of the town or hire vacant houses for the season. The bank edging the plain on which the town, a miserable collection of low houses, is built, is high above the sea, which here makes a beautiful indentation constituting the bay. The sea rolls in with heavy breakers, and the surf tumbles in grandeur and beauty. The surface of the water seen from the high bluff is clear; and during the morning we saw a number of porpoises sporting beneath the extended sweep of the curve lines of the inrolling swell, which here beautifully bends in conformity to the curvature of the shore of the bay in its roll almost the whole width of the spacious basin. surges that rolled in above them. A hundred eyes from the porticoes overlooking the bay were on those graceful sporters in the deep, as they glided at their pleasure across and around the bay. The ladies mostly ride down the steep bluff to the beach, where the bathing houses are located, and again ascend the bluff on horseback. The bathing establishment consists of slight houses formed of cane and mats, where the women and men adjust their bathing dresses and re-attire themselves after sporting in the surf. Both sexes bathe promiscuously together, and some of the Limanian women venture far out beyond the breakers, and are cradled in handsome style and on a grand scale upon the un-combing surge of the far-out rollers. To reach this position, however, it is essential to dive beneath the heavy crests of the same surges, which break in foam and cascades and overwhelming and whirling currents, as they reach nearer in to the beach. La Senorita Gertrudes is an interesting specimen of a Limanian beauty. surf in its finest magnificence, and the grander view there, than at Callao, of the majestic sea. And Commanded By Commodore George C.Read. Geoff Cater (2012) : Fitch Taylor : Tahiti and Peru, 1842.